Canadians Love Poop, Americans Love Pizza: How Emojis Fare Worldwide : All Tech Considered A study analyzes more than a billion pieces of emoji data across 16 languages and regions to gauge how different nations communicate. Most emojis sent are happy faces and other positive symbols. SwiftKey analyzed more than a billion pieces of emoji data, organized by language and country. The poop emoji was most popular in Canada. Smartphones have become an essential part of many people's lives — 64 percent of Americans own one. And just as smartphones grew in popularity, so too have emojis. There are now more than a thousand emojis, and some of them can really say a lot about how people are using language and communicating. "The overall thing we noticed is that 70 percent of all emojis sent are positive and so that's probably a good thing that we're talking to each other positively and using emoji to enhance that," Braidwood says. "Canadians lead the charge in their use of money, violence, sports-related, raunchy, and even the poop emoji," he says. 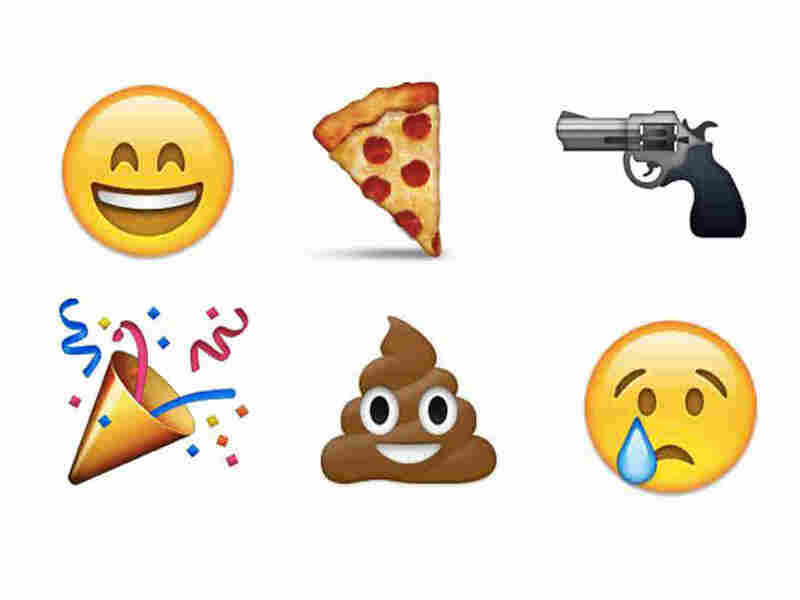 Americans are second behind Canada in their love of violent emojis, such as guns. But one thing Americans also really, really love is pizza. "Pizza was one of the most frequently used [emojis] in the U.S., as well as the chicken drumstick ... and I think it shows you that, versus other nations, you guys have particular food habits," Braidwood says. "In Australia we found that emojis that referenced drugs, alcohol, junk food and holidays were used much more than any other nation," he says. He also notes that the French really are hopeless romantics. They use heart emojis four times more than anyone else. And Arabic speakers are big fans of the rose emoji, using it 10 times more than other language speakers. "On a slightly less positive note, one of the really fascinating things that we found out is U.S. Spanish-speakers were the most negative," Braidwood says. Spanish-speaking Americans used sad faces more than any other language. "The most popular emoji that they used out of the sad faces was the crying emoji," he says.